The Synod Staff works with congregations in candidacy, the call process, formation, leadership development, stewardship, evangelism, church finance, property administration, congregational management, and conflict resolution. The staff also maintains the roster and carries out work in accounting and communication. Preach and teach the apostolic faith of the Church. Shepherd of the rostered leaders and congregations of the synod, exercising both pastoral care and discipline. Provide for Word and Sacrament ministry within the territory of the synod, including the Church’s power to ordain. Oversee the work of the Church’s mission within the territory of the synod. Give witness to the unity of the Church as a member of the ELCA Conference of Bishops and as the synod’s chief ecumenical officer. Bishop Satterlee is an internationally recognized scholar, sought after preacher, speaker, and teacher, and published author. 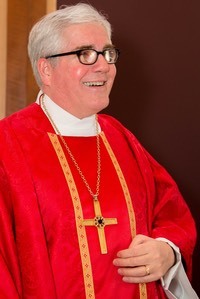 Learn more about Bishop Satterlee and find his public schedule at his personal webpage.